Uber is facing another set of class-action lawsuits from Florida and Illinois. Two more drivers have taken their complaints over their employment status to the court. The ride-hailing company has not yet settled their driver lawsuits but they recently submitted a proposal for a $100 million settlement in the two previous cases in California and Massachusetts. According to Fortune, the new lawsuits filed in Florida and Illinois claim that the company has violated the Fair Labor Standards Act. The two drivers are now seeking to recover their unpaid overtime wages as well as other expenses. The Illinois lawsuit also seeks to recover tips saying that Uber’s misleading messages to passengers have cost the drivers, Los Angeles Times reported. The driver claims that the tips were earned but were stolen by Uber or got lost due to the communications and policies of the company. The Illinois and Florida lawsuits are the first of its kind following the former lawsuits. The supposed $100 million settlement is an effort by the company to retain their driver’s status as contractors as it is fundamental to the business model of the ride-hailing company. A company spokesman said in a statement that nearly 90 percent of their drivers love Uber because they love being their own boss. The spokesman added that the employees earn “a fixed hourly wage, and lose the ability to drive with other ridesharing apps as well as the personal flexibility they most value,” Tech Crunch reported. Aside from the $100 million settlement proposal, Uber also said that they will allow drivers to form local associations and adjust their policies. They also will clarify that passengers are allowed to tip drivers if they want to but it should not be through the app. 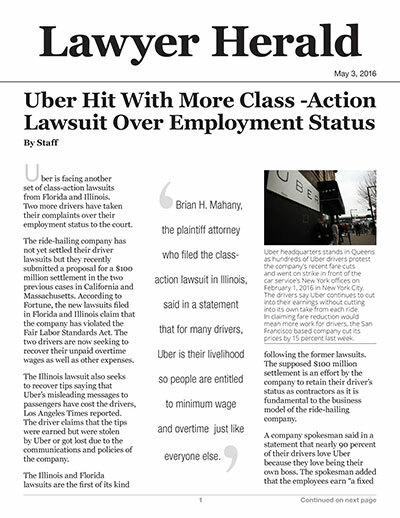 Brian H. Mahany, the plaintiff attorney who filed the class-action lawsuit in Illinois, said in a statement that for many drivers, Uber is their livelihood so people are entitled to minimum wage and overtime just like everyone else.